"Every magic trick consists of three parts, or acts. The first part is called The Pledge. The magician shows you something ordinary�a deck of cards, a bird or a man. He shows you this object, perhaps he asks you to inspect it, to show that it is indeed real. But of course, it probably isn't. The second act is called The Turn. The magician takes the ordinary something and makes it do something extraordinary. Now, you're looking for the secret, but you won't find it, because of course, you're not really looking. You don't really want to know. You want to be...fooled. But you wouldn't want to clap yet, because making something disappear isn't enough. You have to bring it back. That's why every magic trick has a third part. The hardest part. The part we call The Prestige." Who knew we'd have had two Victorian-era magician movies released theatrically in 2006? Though both Neil Burger's The Illusionist and Christopher Nolan's The Prestige seemingly treading on similar ground, the reality is that the differences between the two are actually rather great, and Nolan manages to edge out Burger in terms of presenting a dazzling-yet-serpentine tale that tries its hardest to confuse and confound right up to the very end. 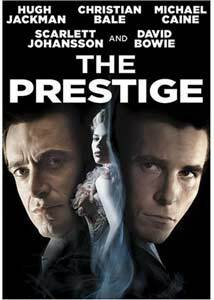 Based on the 1996 novel by Christopher Priest, Nolan has been able to successfully adapt a screenplay that weaves an intricate mental and physical battle between two celebrated stage magicians�played by Christian Bale and Hugh Jackman�with the search for revenge and the secret to the ultimate magic trick. As Nolan loves to do with his films, the narrative constantly moves backwards and forwards on itself. Keeping its own secrets hidden for as long as possible, the story follow the lives of Angier (Jackman) and Borden (Bale) as they intersect, often with very deadly consequences, all filtered through the quest for the knowledge of how the signature Transported Man illusion is performed. Is it actual magic or just a grand illusion? Is it worth murdering for? How does Nikola Tesla (David Bowie) figure into all of this? And at what price comes fame? With a story that is so multi-layered and a timeline that moves around as this one does, it might be easy to overlook the cast, but there is especially good work on display from actors that also appeared together in Nolan's Batman Begins. No surprise, but Bale delivers another of his quietly explosive performances, the kind in which one can practically sense the danger lurking just below the surface. He's the central mystery man here, the lynchpin that forces Jackman's Angier to want to go to the next level, and it's a subtle yet dramatically intense turn. Bale is almost eclipsed by Michael Caine as Cutter�an illusion designer�who imbues the simple explanation of a magic trick with a devious kind of dark majesty that he makes look completely effortless. There aren't many films that make me want to immediately rewatch them (oddly enough Nolan's Memento is also one of them), but the elaborate twists of the conflict and resolution in The Prestige are told in such a way that by the time we theoretically learn the truth, it all demands sitting through it a second time just to see how all the pieces fit together. And the fact that it almost holds up better the second time through�where having the full knowledge really clarifies and solidifies the story�means that Nolan has indeed tricked us. And tricked us well. Image Transfer Review: The Prestige comes from Touchstone with a strong 2.35:1 anamorphic widescreen transfer. Nolan employs what is meant to look like minimal natural Victorian-era lighting, and black levels are deep and solid throughout. Plenty of shadows and dimly lit sequences, yet the transfer never becomes murky. The color palette stays generally on the dark side, save for occasional bursts like Piper Perabo's outfit, and fleshtones appear consistently warm and natural. Audio Transfer Review: The main audio track is an immersive Dolby Digital 5.1 mix that handles the sometimes thick Victorian accents quite well. Voice clarity is clear, with a deep, rich resonance. A very pleasing sense of spatial depth across the front channels, with nicely placed directional pans. Rear channels carry score elements and things like the crackle of the Tesla machine fill out all corners. Extras Review: A little disappointing when it comes to extras, with no Nolan commentary to sift through, just the five part The Director's Notebook (19m:30s), divvied into separate sections entitled Conjuring the Past, The Visual Maze, Metaphors of Deception, Tesla: The Man Who Invented the 20th Century, and Resonances. At just under 20 minutes, it's not nearly enough time to delve into the intricacies of the story, and we're left with only some superficial comments from Nolan, among others. There's also a rather extensive photo gallery, broken down into four sections: Film, Costumes and Sets, Behind the Scenes and Poster Art. The disc is cut into 24 chapters, with optional subtitles in English, French, or Spanish. No real extras to speak of for this release, but The Prestige has enough clever twists and turns that the film itself is enough. The audio and video transfers are first rate, which is important, because you'll want to watch this one more than once. Are you watching closely? Highly recommended.